Tart and tangy, this easy pumpkin soup goes beautifully with fresh, warm tortillas and a spinach salad for a quick and cozy autumn dinner. You can bake a pumpkin, but canned works just as well. (Try canned organic pumpkin! It's worth looking for.) 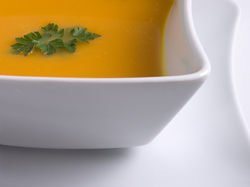 Canned pumpkin will enable you to enjoy a steaming bowlful of soup just 30 minutes after you begin to cook. NOTE: You can substitute baked winter squash or sweet potatoes for the pumpkin. Combine the pumpkin and water in a soup pot or Dutch oven. Stir until uniform. Partially cover, and heat heantly, stirring often. Heat the oil in a medium-sized skillet. Add the onion and bell pepper, and sauté over medium heat for 5 minutes. Add 1 1/2 teaspoons salt and the chile powder, and sauté for 5 minutes longer. Stir in the garlic and 2 tablespoons of the lime juice, cover and and cook for an additional 5 minutes, or until the onion and peppers are tender. Add the vegetable mixture to the soup. Stir well, cover, and let simmer for about 10 minutes. Taste to adjust the lime juice, and also add black pepper to taste. (You might also want to add up to 1/2 teaspoon additional salt.) Serve hot, with all or some of the optional toppings.